The koi is an extraordinary fish, with a variety of mesmerising colours and known for its movement that is quite smooth and fluid. It has a magnificent glistening that really sets it apart from many fish. How often have you been at a koi pond and just felt immense tranquility? To the Japanese, however, koi possess more than just physical beauty. They are richly symbolic creatures. Different koi symbolise various things: The kohuku, for instance, is said to represent career advancement or promotion, the yamabuki, gold in colour, has obvious symbolism linked to wealth and prosperity, and so on. In short, the koi is an overwhelmingly positive energy source in Japanese culture. So, a restaurant that carries the name Koi has a lot to live up to, but with 6 other restaurants carrying the brand around the world, it is not a new concept. Still, I am intrigued to see how my evening will turn out. A facade that belies something very special inside. Koi is part of The Collection on Saadiyat Island within the St Regis Resort. In a short time, it has already made quite a splash - I could not resist the pun. The restaurant describes itself as serving creative traditional dishes inspired by California. I must say it was one THE restaurants that was on my 'must try' list. When I arrive at the restaurant, I am not sure if it is open, so muted is the lighting. I tentatively approach the door which is opened for me before I can - I love that sort of welcome! The door opens to reveal a very modern and chic lounging bar area. Simple, striking and not decadent at all. Very Japanese. Talk about first impressions! Two-floor high ceilings with stunning light fixtures catch my attention as I look to the bamboo plants which serve to wall off the bar from the dining area. The bamboo, plastic, will be one of few false notes in the restaurant. Japanese are all about that which is natural, and I look around the restaurant, especially behind the sushi counter where oversized cuts of wood drive home that emphasis on nature. 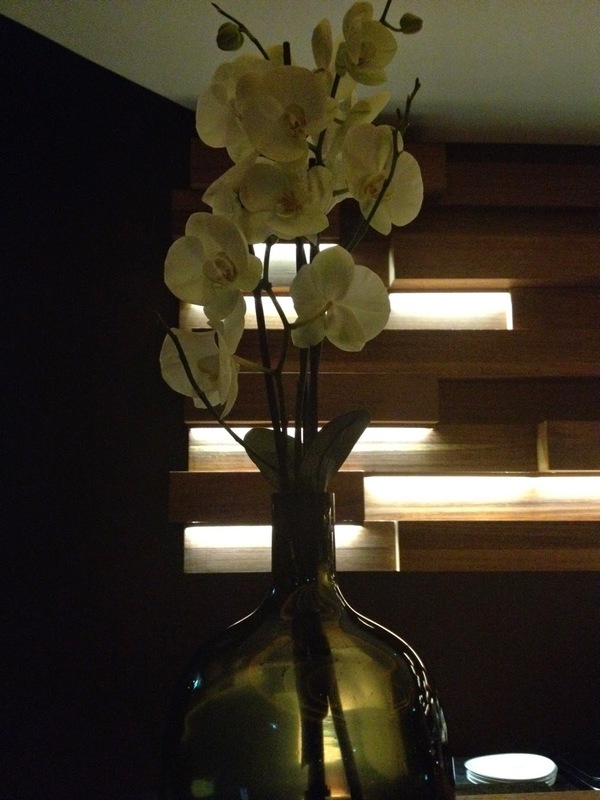 Orchids around the restaurant cannot be ignored. The white orchids in particular are simply breathtaking. Therefore, plastic bamboo is an odd choice. The waiting staff, meanwhile, are dressed in black, adding that swanky element. They are warm and engaging. Interesting how some waiting staff can exude warmth and engage without saying much. I know it will be a fantastic evening. 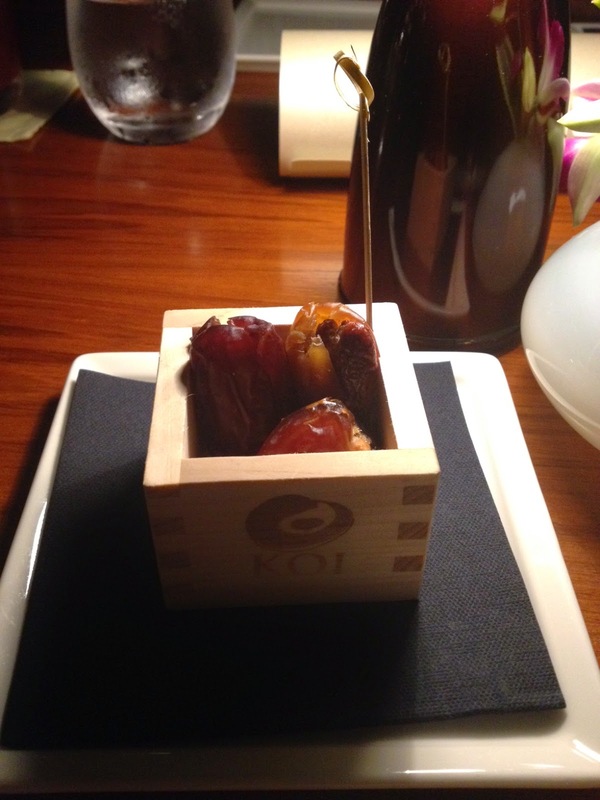 Dates presented in a uniquely Japanese manner. 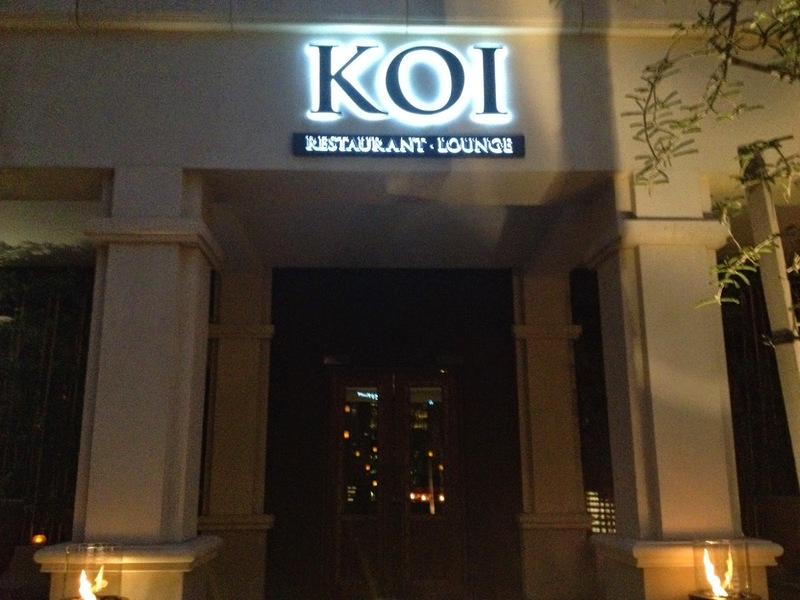 For our dinner, there is a specially prepared set menu that features some of Koi's popular dishes. 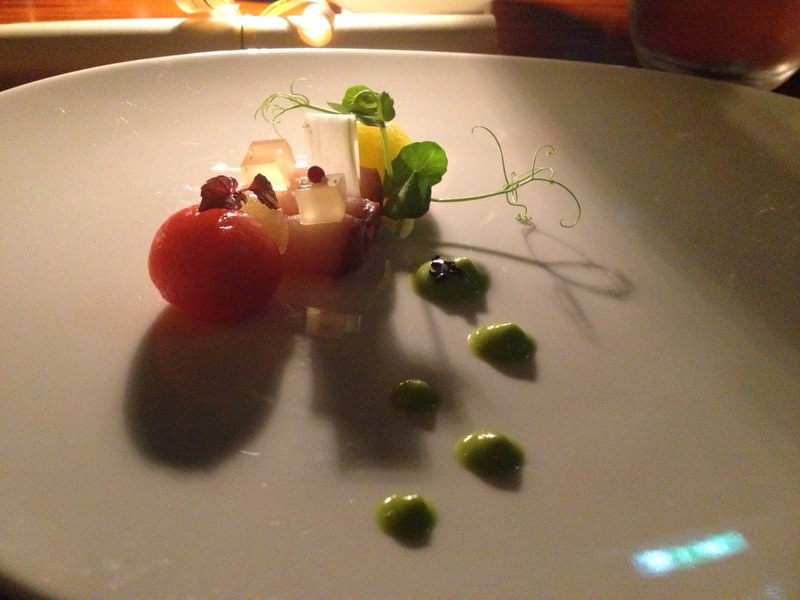 An amuse bouche of salted cured hamachi with yuzu gellee and lemon confit is served. Light and delicate with a bit of shiso leaf taste - nice. My starter is a salmon carpaccio with black truffles. The choice of Norwegian salmon is a microcosm of one aspect that Koi is about: It does not seek to be wholly Japanese. It is about using ingredients which are good, regardless of origin, hence Norwegian salmon. Back to my dish, again, a celebration of freshness and flavour, but nothing overpowering. 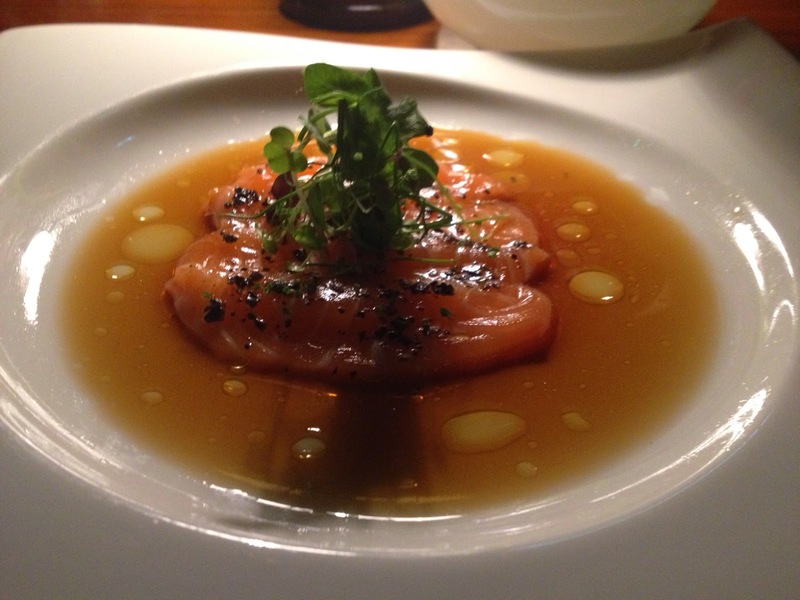 The ponzu soy sauce, which brings a bit of tartiness and citrusy taste to the dish, complements the salmon perfectly. Finally, drops of truffle oil adds another dimension to the taste. Also, oil does wonders for its presentation! Drops of truffle oil can be seen. I am really taken in by the whole experience. Because it is Ramadan, there is no music, but I remark to the manager on duty that I actually love the quiet, the peace - it is quintessentially Japanese to have that quiet. In the meantime, I can't stop thinking about the service. Having a head server who does everything efficiently is one thing, but having a group of servers who have a similar level of excellence is another. I enjoy their presentation of the dishes and the narrative, albeit brief, that accompanies the dish. Chopsticks are changed between servings and this too is something I appreciate. Because Japanese flavours are so subtle, the taste of a dish can be unsettled by the a bit of miso or soy sauce on a chopstick, for example. 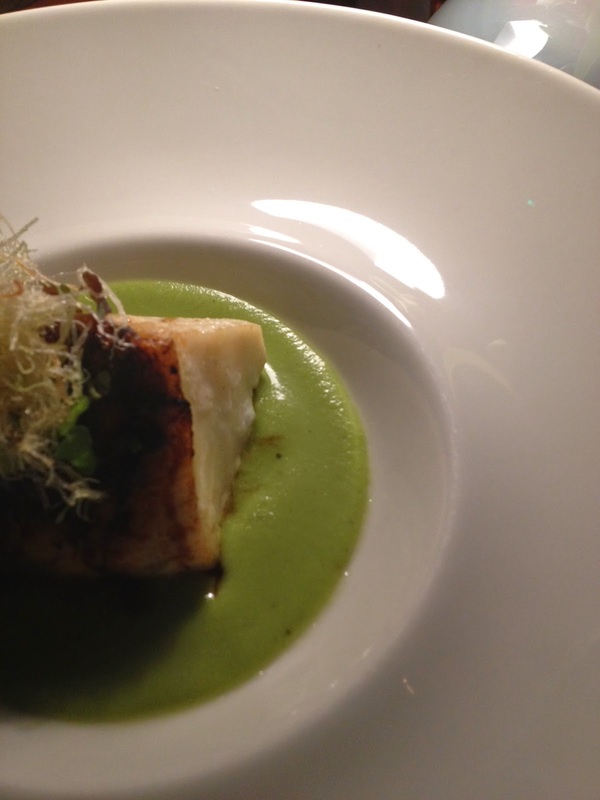 My third course is outstanding: grilled Chilean seabass with honey balsamic glaze and shiso-pea coulis. I love the complexity of this simple looking dish. The seabass, one of those unfishy tasting fish, is enjoyable because of that very subtlety. It is moist and very soft. However, the balsamic glaze adds a bit of salt and zest to it. Then there is the indescribable shiso flavour again, but so refined. Those of you who follow my blog will recall my excitement at the use use of peas with seabass in a previous post. This took me back to that moment, even though this was pea coulis. That is what I find so fascinating about food and tastes - there are all these connections between time present and time past - all created by a scoop of something! The final course before dessert is eagerly awaited. 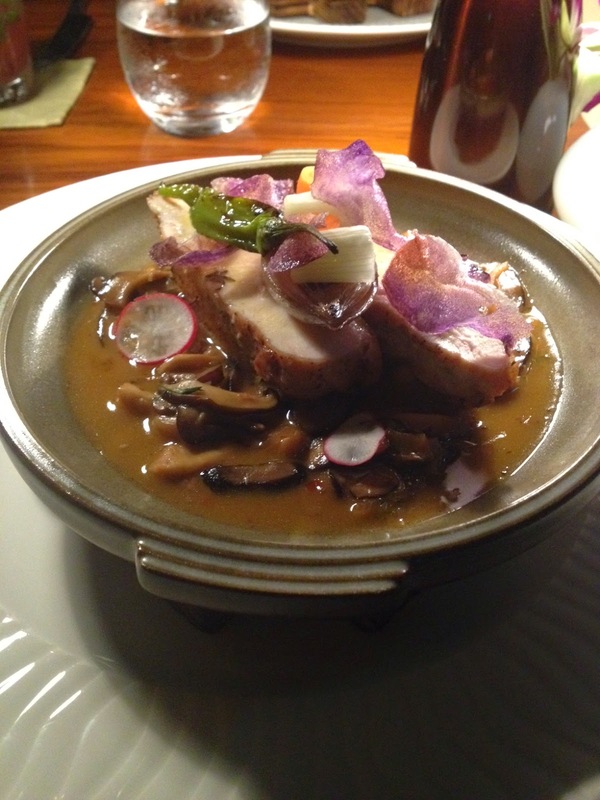 Pan-roasted chicken breast with confit shallot and sweet mushroom soy is presented and my first impression is that of all the dishes, it is the least Japanese of all we have had. Again, though, I like this about Koi. I do not want to use the word eclectic because it is still Japanese, but infused with other influences. Yes, that is it. There is a lot happening on my plate; have a bit of the inner part of the breast with the lightly crisped skin, the sweet mushrooms and the confit shallots, all in one scoop, and you have an atypical dish that I enjoyed and finished! Nothing on my plate. As I await my dessert, I can't help notice the waiting staff again. There is a quiet energy about them. Also, when they address guests, it is clearly audible but just above a hushed tone. Kudos to their training department. these musings are happily intruded upon by the arrival of my dessert. 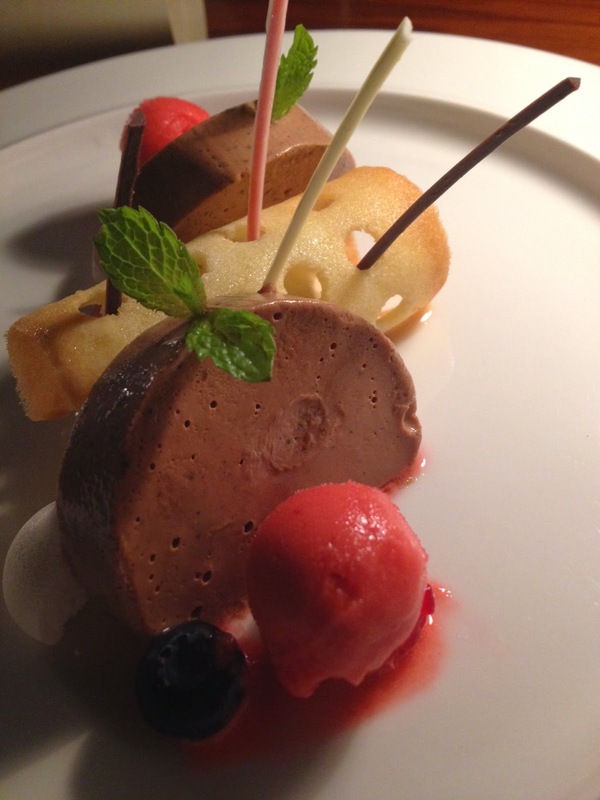 Tofu and sesame chocolate mousse with butterscotch ice cream and raspberry sorbet - yes, you read it right. If there was a lot happening on my third course, then the dessert is a hive of taste and textural action - the tofu and sesame mousse blows my mind. This marriage of what is unusual dessert elements for non Japanese with the more traditional, is illustrated in this mousse. However, and this is the important point, it is a harmonious marriage. With a piece of mint it reaches another level. Scrumptious. Lastly, the sorbet and ice cream provide a welcoming flavour and textural contrast and were it not for social etiquette, I would used my finger to lap up the last bit of this heavenly dessert. Koi lived up to my expectations and exceeded them. The service, first and foremost, had everything - timely, unobtrusive, engaging without words and knowledgeable. Secondly, the dishes carried with them a joy in presentation and taste that I have missed. 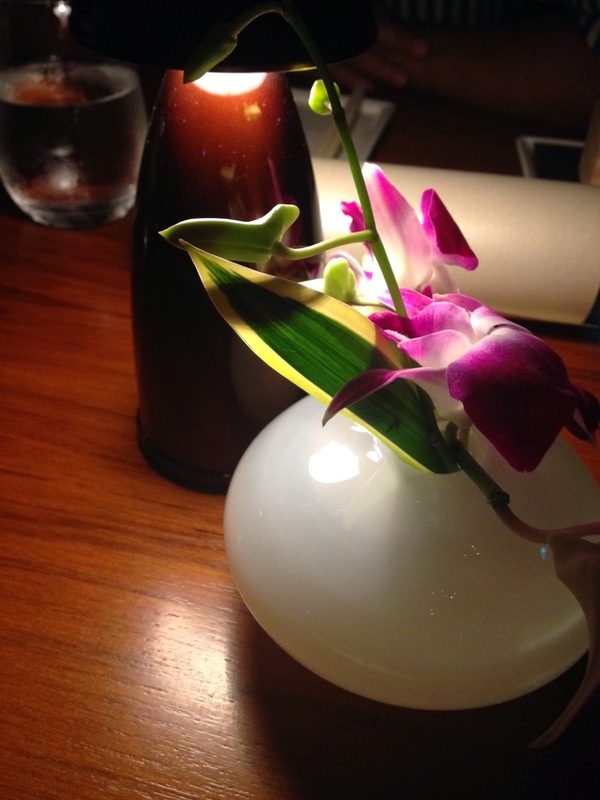 The blend of the simple and the sophisticated that was evident on a number of levels were in-keeping with the restaurant's approach to its cuisine in which Japanese was successfully infused with other influences, without undermining the 'Japaneseness' of the dishes we had. As I put away my pen, the koi came to mind again - colourful, tranquil, evocative and an expression of life - symbolic of Koi this night.